The international break has finally come to an end and the Premier League is back in town this weekend. And to give the fans something to celebrate the return, the competition will host one of the most exciting battles in an early kick-off today. In what could be one of the games of the season, Liverpool will travel to Wembley to take on Tottenham Hotspur, who are hurting from a loss to Watford. Liverpool’s Brazilian cannot be judged for the error against Leicester or his first three clean sheets but he is far too new to the setup. Hugo Lloris has been effective for far too long and has also made 2.7 saves per game this season, which gives him a place in this lineup. Unfortunately, Spurs will miss him in this particular fixture with the French superstar ruled out injured. Though not as effective as Trent Alexander-Arnold at the back, Trippier is a more balanced full-back, who has already registered a goal and an assist and deserves a place in this side. Jan Vertonghen narrowly misses out to his Belgian teammate Alderweireld, who has won 1.7 aerial duels, has two tackles and 1.3 interceptions per game this season and has made a fine comeback after a controversial year. The Dutch international is an absolute colossal figure at the back. He wins 4.3 aerial duels and makes 5.5 clearances per game and is an easy choice for this role. While Ben Davies has been inconsistent, Liverpool’s Robertson is only showing progress by the game. He has two assists, 2.5 key passes, three tackles and an interception per game to his name along with 15 chances created, which makes him one of the most influential players in this XI. 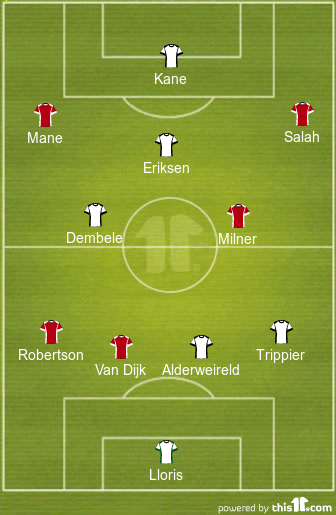 With Jordan Henderson and Eric Dier struggling this season, Mousa Dembele, who wins 1.5 tackles, and has a passing accuracy of 86%, gets into this XI, just ahead of the first few names. 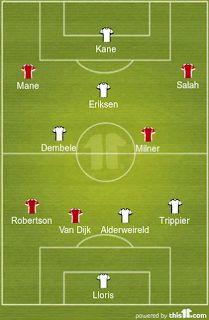 With Naby Keita relatively new to the league, Milner, who has a goal, two assists, 1.8 tackles won and two interceptions per game, gets into this XI in the midfield. With more chances created than any other player in the league bar David Silva, Salah, who also has two goals and an assist this season, is an automatic choice on the right wing. With an assist, two key passes and a passing accuracy of 83%, Eriksen has been the best playmaker from these two teams this season and will find a place in the no.10 role in this combined XI. With four goals to his name already, Sadio Mane has been in electric form early this season and is unrivalled for his place on the left flank. The English striker has two goals and an assist to his name along with 1.3 key passes per game. He is an easy choice for this side, with Roberto Firmino struggling at the start of the season and Lucas Moura not really an ideal fit for the striker’s role despite his early season form.